My Savior, Lord, there is none like you. Your mighty power reigns over all the earth. We come before you on this precious day, to humbly beseech your protection upon the youths of the nation. Guide them accordingly with your grace. Mold them into who they are destined to become. Help them to be ambitious and to be excellent young role models to their peers. But most of all, give them strength to repel bad company and negative influences. 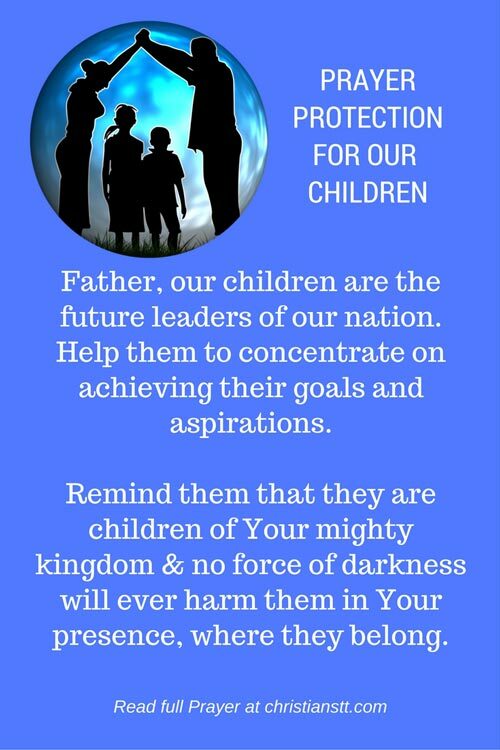 Father, we know that the children are the future leaders of our nation. Help them to concentrate on achieving their goals and aspirations. Remind them that they are children of Your mighty kingdom and no force of darkness could ever harm them in your presence, where they belong. Protect them against any negative words spoken against them. Bind any curse that is set upon them and their families. Rescue them, Oh Mighty Father, from the struggles of their daily lives with Your grace.